It’s pretty safe to say that loop pedals aren’t getting enough spotlight – rock ‘n roll is busy with fuzz and drives, metal’s mainly interested in distortions and delays, gentler music genres mainly dabble with reverbs and equalizers, that’s a given. It’s also true that certain guitarists are ‘afraid’ to use loop pedals, and that’s not even too harsh a word to describe it. Namely, loop effect does a major thing for your tone – it allows you to simulate playing several guitars at the same time. That does sound like a double-edged sword, mainly because you’re not allowed to make a mistake, which is also true. However, what we want to accentuate here is that with a proper looper pedal, you can find that missing link you searched for in order to complete your sound. You can complement your tone by means of juxtaposition. There are so many looper effect pedals, and not all of them are so scary and hard to use – we’ve included plain, easy-to-use models, as well as those more complex ones in our review. Kick back and browse through our selection of the Top 8 Best Looper Pedals you can find in 2019. Or, if you want help on what to look for, best sure to check out the buying guide at the bottom. If you are looking for different types of pedals, be sure to check out our other guides on Chorus Pedals, Distortion Pedals, and Reverb Pedals. Great for practice and some live performances, the AP Nano is compact and gives up to 10 minutes of loop time. Let’s open up our review of the best looper pedals with Ammoon’s AP 09 looper pedal from the ‘Nano’ series. It’s a relatively basic, relatively cheap pedal that offers a plain set of features and is suitable for practice, live performance, and even gig practice if need be. First of all, it features a very small footprint. This is great for live performances as it leaves you plenty of room for your other guitar effect pedals in your rig. Despite being small, it has a rugged chassis made of aluminium alloy which is clearly built to last. You’ll be able to record some 10 minutes of loop time with it – this is pretty basic, but after all, AP 09 is a basic looper pedal. Though the record time might not be exemplary per se, there’s no limit to overdubs. The one-key operation is yet another reason why this pedal is so good for live performances – simply adjust the level knob to be in harmony with your other pedals, and you won’t need to touch it for the rest of the gig. The AP 09 is also pretty great for band practice (or home practice for that matter) for the same reasons why it’s so good for live performance. We wouldn’t recommend using it for studio work unless you don’t have another looper pedal and you’ve made a firm decision that you really want to introduce loops to your solos or other lead sections. 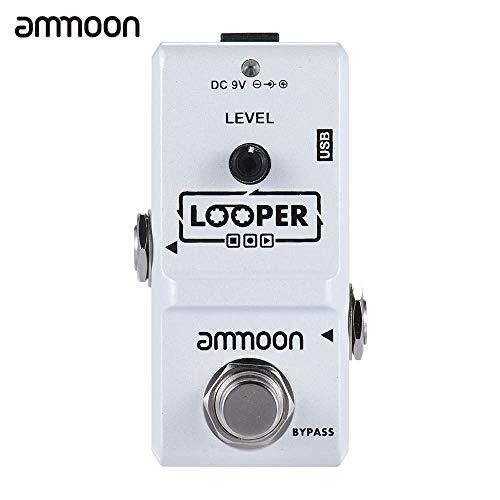 In a nutshell, Ammoon’s AP 09 loop effect pedal is very affordable, has a small footprint, and does a great job for the money. It has a somewhat mediocre total loop time, a firm chassis, and it’s very easy to use. Sleek and simple that works great for practice and small gigs. Next up is TC Electronic’s Ditto looper pedal. 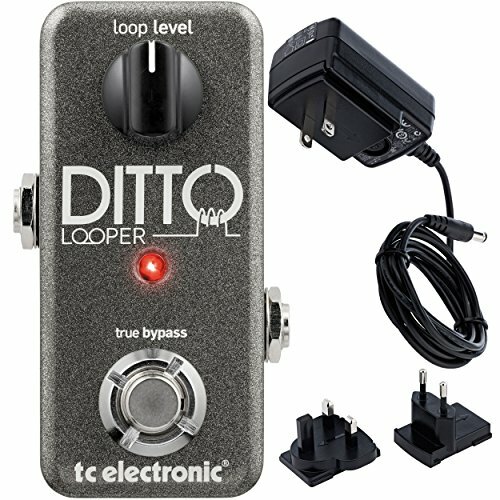 Similar to Ammoon’s AP 09, the ‘Ditto’ looper is extremely easy to use. Aesthetic wise, it looks cool and modern, to say the very least, but it doesn’t lag one bit in terms of performance. Now the biggest difference between this particular looper pedal and our previous pick is that this one is made by a slightly more popular brand. That doesn’t necessarily mean it’s better per se, but it’s a fact that different kinds of technologies were used hence you should expect a different feature setting. Ditto has only five minutes of total loop time, which is perhaps inferior to most loop pedals, but it’s quite sufficient for a basic pedal. In fact, it makes it even easier to use. Speaking of which, there’s only one knob labelled as ‘Loop level’ which is basically a volume knob, and a true bypass switch onboard. Now, what makes Ditto better than other similarly priced looper pedals is its reliability. Its audio quality is consistent, there are no known issues with any of the features it comes supplied with, and most people who’ve used it would recommend it as much as we do. With such a small number of features, Ditto is ideally used for live performance, home practice, or for band practice as you won’t need to worry about adjusting the knobs after every song (since there’s only one). The main benefit of Ditto being that it’s so incredibly easy to use could also be treated as its only flaw in certain cases. Namely, you don’t want to enter a studio with it, as the sheer lack of versatility it fails to provide will leave you with limited options. Overall, this is a very reliable, very simple pedal meant for beginner guitarists. If you don’t have any experiences with loop pedals, using Ditto will surely come easy for you. Twelve minutes of recording time and ten loops makes this a very versatile looper pedal for advanced guitarists. If you think acoustic guitar players aren’t using guitar effect pedals, simply look at Ed Sheeran. Namely, this world-class musician made using loop effect pedals on acoustic guitars popular. So, if you’re looking for one to use on your guitar, we suggest that you give Electro Harmonix 720 a try. In case you aren’t so familiar with the brand, Electro Harmonix are one of the leading names in guitar effect pedal industry. Their ‘Small Clone’, ‘Soul Food’ and ‘Big Muff’ are regarded as some of the best pedals ever made, and 720 also falls down in the same line. 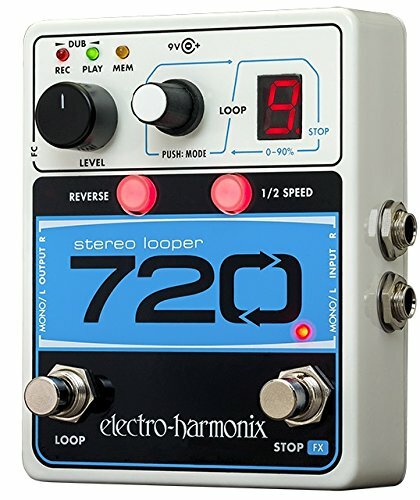 First and foremost, 720 is a highly versatile looper effect pedal. It offers a total of 12-minute recording time with ten independent loops at your disposal. The features it comes outfitted with are relatively plain, as they include stop, undo/redo, reverse, and the half-speed effect, all of which can be used with a push of a single button. Its connectivity is also exceptional, as it has enough stereo ins and outs for two instruments to be paired to it simultaneously. That’s just one of the reasons why it’s exceptionally great for bands, especially those that play unplugged music. As for the reason why 720 is so good for acoustic guitars, it has a silent footswitch. Now, this might not seem like much, but the sound of a pedal going on or off can easily attract some attention in a not so positive way during a live show. Having a silent footswitch makes sure that you can introduce your loops to your music without the crowd ever noticing. We’ve also mentioned that this loop pedal is very versatile, so how does that apply for acoustic guitars? Having ten independent loops at your disposal can make you a one-man-band, and having the opportunity to connect up to two instruments at once means that you can wire up a second guitar (or a bass) for an enhanced acoustic performance. It’s actually great for every kind of playing scenario – band practice, home practice, studio work, and live performance. Now, if we are to completely forget that we’re talking about a pedal that’s ideal for acoustic guitars, using it live with an electric guitar might prove to be a bit challenging, simply because it has a relatively big footprint. We loved the built-in display that shows the progress of the current loop. Great instant feedback during performances! 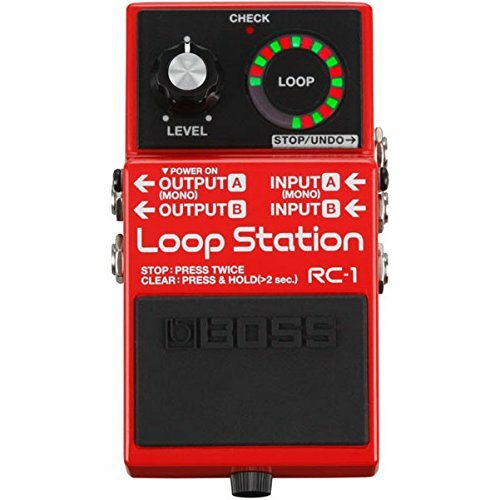 We’re slowly moving on to a bit more complex looper pedals, and among the last ‘straightforward’ models we recommend that you give a shot to Boss RC 1 Loop station. This is a simple, very easy to use looper pedal that’s practical in many respects, making it ideal for live performance. One of the most innovative features Boss has introduced to the RC 1 loop station is the ‘smart’ loop indicator. It shows you the ‘progression’ of the loop on the circle-styled indicator, something that resembles the ‘loading’ pattern the most. The reason why this is so handy to have live is because you’ll actually know exactly where you are with your selected loop, which gives you the ability to easily adapt to any scenario where something’s gone awry. On top of that, we’ve mentioned that the loop station is fairly easy to use. There’s just one knob reading ‘level’ – this is basically a volume knob, allowing you to easily tune your looper pedal in accord to your other pedals. Speaking of which, the RC 1 has a standard issue Boss design, meaning it has a very durable casing and a small footprint – again, qualities you want to look for in a pedal when you’re performing live. It has 12 minutes of total stereo recording time which should be just enough for live gigs, home, and band practice. You might need a bit more than that if you intend to enter a studio to record, but unless your looping needs are very specific and delicate, it should suffice in this scenario too. Yet another great thing about the Loop Station is the fact that the recorded phrase remain in the station even if you turn the pedal off. This is the reason why it’s so good for band practice, as you won’t need to redo your loops over and over again. 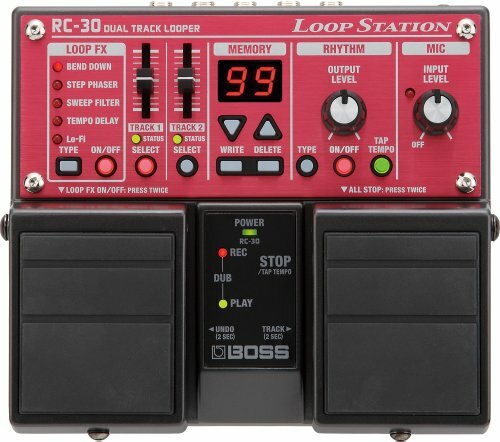 Last, but certainly not least, Boss RC 1 loop station has exceptional connectivity. It has two ins and outs (mono and stereo), meaning that you can wire up two instruments at the same time. It’s not perfect, however, as it functions a bit differently when compared to other loop pedals. The main issue with Boss RC 1 can be seen in its method of operation. Namely, in order to stop the loop you need to press the pedal twice. This leaves plenty of room for error, especially if you’re using it for the first time. Additionally, if you make a mistake and hold the footswitch for over two seconds, you’ll clear the loop. Over six hours of playback time and a ton of advanced features and modes to help you craft the perfect performance. 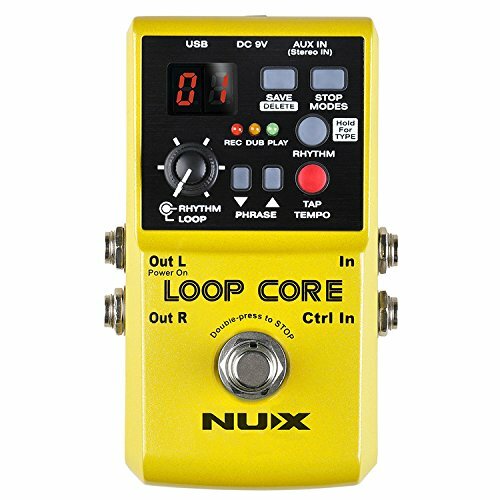 Next up is NUX’ Loop Core guitar effect pedal. Though the brand is not as famous as Boss or TC Electronic, they certainly have quite a lot to their name – you might’ve heard about the JTC ‘Drum & Loop’, the Atlantic, Roctary Force, Tape Core, or Solid Studio, all of which are exceptional effect pedals made by this brand. But, let’s not digress, so let’s stick to the Loop Core. First and foremost, let’s put it outright, this is a highly versatile loop pedal with six hours of total loop time, forty different drum patterns, ninety nine user memories, and a tap tempo feature onboard. It’s clearly not as easy to use as TC Electronic’s Ditto, but it’s still a relatively straightforward loop pedal. There’s just one knob for Rhythm/Loop that has six levels, phrase selector buttons, the tap tempo, rhythm, save, and stop modes buttons. Holding the ‘rhythm’ button allows you to choose one of the drum patterns, and you’ll immediately see the change on the LCD screen in the upper-right section of the pedal. Though it is a bit more modern in design, it uses the traditional method of storing and using loops, so it might not be the perfect pedal for a beginner, but an intermediate level player would welcome its versatility. One of the best things about this pedal is that switching between phrases suffers no latency losses. Similarly to the ‘720’ which has a silent footswitch, you (and your audience if you’re a live performer) won’t even notice as you toggle phrases and modes. The downfall of Loop Core is that it’s not durable per se. Namely, there are a lot of selectable features onboard, and most of them are fairly flimsy – the LCD display, buttons, and the three indicators are prone to breakage. However, the housing is sturdy as a brick house. 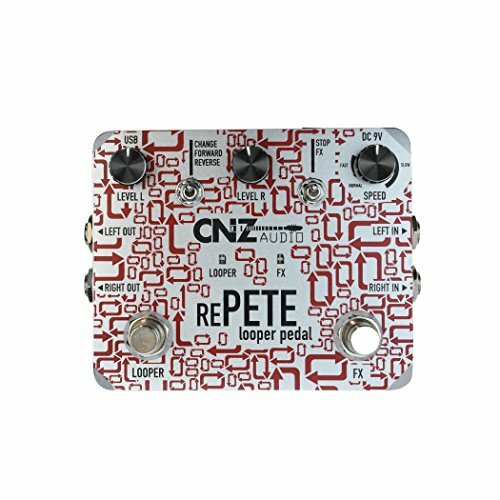 With the ability to pair up multiple guitars at once and USB connections, the RE-Pete is great for the more advanced musicians. ​We’ve mainly covered ‘plain, easy-to-use’ loopers up until this point, but here we have something totally different. We’d like to begin by saying that Re-Pete isn’t, by any means, user friendly or easy to use. It’s complex, and oftentimes confusing, but isn’t that the reason why you should avoid it? We daresay not at all. The first thing anybody will notice about this looper pedal is the crazy, wild design. There are arrows everywhere, which sadly makes the feature descriptions a bit harder to read. However, the silver lining here is that you can brag about and show off with your unique, exquisite pedal anywhere, especially since its usability, flexibility, and versatility are all pretty high. Putting the aesthetic aspect of Re-Pete aside, the second most notable feature is that it allows up to 10 minutes of total loop time. A bit better than average, but still plenty for live gigs and band practice. Unlimited overdubbing is also provided, but those are somewhat of a more ‘regular’ features, let’s get on to the unique elements of this wonderful looper. Connectivity is great here since you’ll be able to pair up two guitars simultaneously via dual inputs. Each output has a separate adjustable volume and loop levels which are controllable via their corresponding knobs (Level L for left and Level R for right). The speed knob works universally though. On top of that there’s the 3-way switch on the left side which governs the ‘direction’ of the loop (forward/reverse) and the basic on/off switch for the effect which is taking place. Speaking of which, this can get a bit confusing, but there’s the ‘FX’ button on the bottom right of the pedal – once you use it, you can further customize its effects with the aforementioned switch. Another great thing about the Re-Pete is that it’s USB compliant. This means that you’ll be able to upload your own loops or download the ones you’ve gotten with the pedal to your PC. Like we’ve said, the biggest issue with this pedal is its confusing design. Apart from being slightly more difficult to use, there are no significant downfalls – it’s great, it’s decently affordable, and it works like a charm for studio performance. Live performance might be a bit difficult for you the first time you use it (maybe even the second and third time) simply because the controls are sketchy. The JamMan has just about everything a performer needs from a looper pedal. From great playback memory to over 200 memory banks, you can't go wrong. 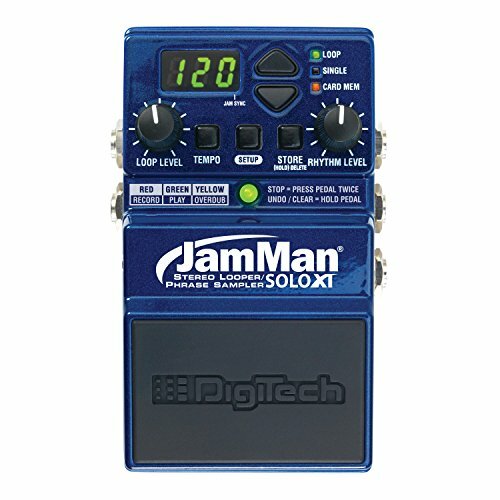 Digitech pedals are loved by guitarists because this brand is pretty innovative – the Jamman Solo XT is a great example of that. Basically, this pedal is an improved version of Digitech’s Jamman Solo, and it comes packing a very versatile set of features. Though this looper doesn’t necessarily resemble our previous pick in terms of aesthetics, it does a bit in terms of method of operation. Namely, the controls here aren’t so user friendly at start, but with some practice you’ll find the Jam Man as a very powerful tool in your arsenal. First and foremost, let’s point out that this looper offers a total of 35 minutes of store-able stereo time across two hundred internal memory banks. That’s not just plenty – it’s massive and superior in comparison to every other looper in the price range. If versatility is what you’re after, you can further enhance it here by adding a micro card to the fray, granting you a bonus of full 16 hours and additional 200 memory banks. Additionally, this looper has a durable metal chassis and a stompbox style footswitch (which is sadly not as silent as Electro Harmonix’ 720 looper). Now, the peculiar thing about Jam Man Solo XT is that there are three main types of settings you can use, but there’s only one indicator light. What happens is that the light changes its color as you switch between settings (red for ‘record’, green for ‘play’, yellow for ‘overdub). Might be tricky to memorize these and the plethora of sound banks at first, but if you simply imagine it as traffic lights, you’ll get it down in no time (stop to record, wait to overdub, go – play). This is definitely one of the most well-rounded loop pedals you’ll ever find, not just in the price point category, but the sketchy part is figuring out ‘which end goes where’. After some practice, you’ll find Jam Man Solo XT as very valuable, regardless of what use you intend it for. Not nearly as compact or simple as the previous entries on our list, but the Boss RC-30 is the Rolls Royce of looper pedals if you need everything you can get out of it. ​Let’s wrap up our review with another great looper from Boss – this time we’re recommending a bit more expensive model which bears the name RC 30 Phrase Looper Pedal. Basically, if you liked the RC 1 loop station, you’re going to adore this one, as it can be considered as its improvement of sorts. First and foremost, the RC 30 is more of a ‘station’ than RC 1 actually is, simply due to the fact that it has twin pedals and 2 synchronized tracks, both of which come supplied with their own volume faders, as well as their own track select button. Even so, this pedal is meant for a single instrument only, as that’s as much RC 30’s connectivity allows. That’s not necessarily a minus in terms of value, as you’ll get a richer sound and some extra versatility on the side. The ideal setting in which you can use this pedal is in studio – there are 99 integrated memory banks on which you can store your loops, but there are also five built in Looper ‘effects’ you can use to spice them up even further. The bad thing is that this pedal is fairly difficult, if not even challenging to use for live performance. Two knobs and two volume faders, not to mention two foot switches which can easily be confused with one another mean that you’ll have to pause after each song and toy around with the loops, wasting some time in the process. However, if you’re looking for a looper pedal for studio work, than you simply shouldn’t look any further, as RC 30 is the best of the best in that particular department. With unparalleled versatility and stereo audio quality atop the onboard loop effects, you might not even need additional pedals. So, in conclusion, Boss’ RC 30 phrase looper pedal is slightly more expensive than average, that’s a given, but it’s also the most versatile pedal Boss ever put out. Its audio quality is simply staggering, and who knows, with some practice you might even be able to use it for your live gigs. You’ve seen some of the best loopers out there, and it’s only natural that you feel like you can’t decide which one is better than the next. That’s only natural, as not all loopers provide the same benefits. It’s you who will pass on the final judgement, but even so we advise you to check out this buying guide, as it may prove useful in understanding the criteria we used while picking the models in the sections above. Without any doubt, your budget will determine which looper pedal will be ‘the best for you’. There are models that cost barely $20, but there are also models that cost $200. Without going too far into detail – logically, the $200 beats the $20 model in terms of performance, but what about the vast majority of models that are in between? Namely, the average price of a quality looper is somewhere between $50 and $100. Even though this is still a broad price span, it’s a bit easier to figure out how much money you need to save up for a quality model. The reason why you need to decide your budget before everything else is simply because you might get a bit carried away, picking an expensive loop pedal that might not be the one you can actually even use. For example, one of the more expensive models in this review is Boss RC 30. A beginner guitarist might feel like this is everything they ever wanted because the pedal is big, there’s a plethora of features onboard, but what happens is that they eventually get a pedal that they can’t use, or better said, they can’t utilize the features efficiently as some experience is needed. Going back, there’s another reason why you should consider getting a more expensive looper pedal, or better yet – the reason why you should avoid cheap loop pedals. Although the ‘loop effect’ in the traditional sense works the same on every pedal, the cheapest models are simply not reliable. You’ll get constantly annoyed by static interference, feedback, casual blackouts, and such. Just as there are different skill levels of guitar play (beginner, intermediate, advanced), there are different loop pedals intended for each one. Knowing where you ‘sit’ will allow you to pick a corresponding loop pedal more easily. Like we’ve mentioned above, a beginner will find a ‘complex’ loop pedal as challenging to use, but at the same time, an experienced guitarist will yearn for more than a loop pedal as simple as Ditto in most cases. Exceptions are possible, but we will get to that matter in the next section. Beginner guitarists with no experience with loopers should avoid complex pedals also because these tend to be more expensive as well. Most loop pedals usually don’t cost a fortune, and it’s a fact that as long as you play, your skill level will advance. That means that one of the more important aspects of choosing a proper loop pedal is knowing what you are going to use it for. There are three main settings of intended use for a looper pedal – practice, live performance, and studio work. Most people get the notion that any looper will do for practice, but that’s not exactly the case. In fact, there are two sides to this scenario. On one hand, you can get a looper that’s too simple and you might get bored with its lack of versatility quickly, putting the loop effect out of your arsenal for a while. On another hand, you might also get dissuaded by the complexity of your looper if it has too many features and you don’t exactly know how to use or program them on your own. Picking a looper for practice is ideally done in accord with your skill level and familiarity with the loop effect in general, so if you’ve never used it, get a budget model and acquaint yourself with how it sounds and how it can complement your tone. Since practice is an ideal setting where pretty much everything begins in terms of guitar play, you’ll be able to play around with your tone and eventually you’ll start saving up for a better, more complex model. Picking a looper for live performance is drastically different in comparison to picking a looper for practice simply because there are more factors to consider. First and foremost, you’ll need a looper with highly visible features, so getting a model with LCD display is recommended. Additionally, you’ll have to keep your pedal rig in mind, as loopers with bigger footprints might not fit in your rig, so you’ll either have to leave it out entirely or leave another pedal behind. Complex loopers should be avoided in this setting, as you’ll have plenty to worry about in terms of playing already. For example, you usually won’t have the time to tweak every single pedal after every song, and loop pedals especially tend to be complex to setup onstage. Lastly, there’s a very specific reason why most players avoid complex loop pedals while performing live – you need to be in sync with your loops at all times, and the more layers, the more complex your loops are, the harder this becomes. That, however, doesn’t mean that you necessarily need to get a simple looper per se – if you’re well versed with the loop effect and how it works, or with specific looper pedals in general, feel free to pick any model you want. Another typical setting for the use of a looper pedal is in studio when recording songs. This might be the simplest of the three matters, mainly because you won’t have the pressure of performing live and we can assume that you’ll already know what kind of loops you’ll be using. Generally, in this case as far as versatility is concerned the term ‘the more, the better’ applies perfectly. You can add as many layers as the song demands, as many effects as you feel you need, and pretty much do everything you want, so this is actually the only scenario where any looper will do. Better said, any looper you think is right is probably right. There’s just one thing to keep in mind here – you probably don’t want to overdo your loops, as most people will expect you to recreate what you’ve recorded live. Knowing this, using complex loopers will definitely come in handy with the demoing process, but using a plethora of overdubs might leave you shorthanded when it comes to the actual live performance. Regardless, your hands are ‘the least tied’ in this scenario when it comes to picking a loop pedal. Some are easy to use hence ideal for beginners, such as Ditto, others, more complex ones as Boss RC-30 are perfect for experienced players who intend to hit the studio with a bit of extra versatility in their pocket. All in all, there are many loopers that are worthy of the title ‘one of the best’, so we hope that you’ve found a suitable looper pedal for your rig in our review. Each of the eight models is ‘best’ in its own right, so simply decide what is it that you’re after.